It's probably about time that we let you all know something: Jen is pregnant. That's right. However, since we always make more than we need we've decided to have twins. Yes, we decided to do it that way. It was in no way a surprise to us at all. However, since no one is interested in reading a blog about babies or parenthood (you can find virtually none on the entire internet) I had to be creative about how I could related this development to food. This was easy given that there are about four hundred web pages devoted to comparing the development of your unborn baby to produce. While Jen uses a different chart I am fond of the Baby Size Fhart from TheBump.com. According to this chart Jen, at eighteen weeks, is currently the proud carrier of two sweet potatoes. Naturally it seemed like a good idea to make a themed meal around our announcement of this occasion. Sweet potatoes didn't seem particularly seasonal given that the weather forecast predicted temperatures in the 70's today. However, since it was only 41 degrees this afternoon I found it would be a safe day to have some sweet potatoes and run the oven. I took advantage of the entirely seasonal cold snap to also brew two recipes from the Brooklyn Brew Shop recipe book Jen got me for Christmas. I brewed the Tea & Toast and the Chocolate Maple Porter. I'm tired of all these large scale breweries I've been enjoying beers from. They're so commercial. These recipes will both yield between nine and twelve bottles each. Any batch of beer that produces more bottles than that is just out for profit. My first batch of beer made 55 bottles! Back then I was only in it for the money. For tonight's main course I made this sweet potato gnocchi which I boiled and simply tossed with olive oil, butter, salt, and pepper. 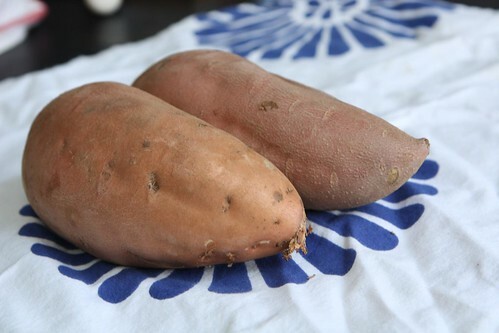 To make the gnocchi I started off by baking the two sweet potatoes in the oven along with one Russet potato. When I removed them I felt an incredible sadness when I remembered that they were supposed to be symbolic of my unborn children. "What have I done?" I cried. "My beautiful boys!" After taking a few minutes to remind myself that these were merely tubers I got to work in peeling them and passing them through a food mill. 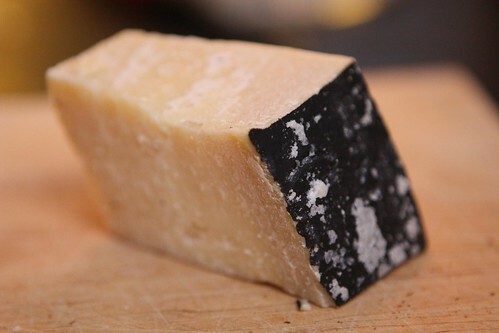 I topped the gnocchi off with this Bella Lodi which is kind of like Parmiggiano-Reggiano except it has a black rind and is slightly cheaper. That's $1.00 a pound less that's going straight into the college fund. That's $1.00 per pound per baby! 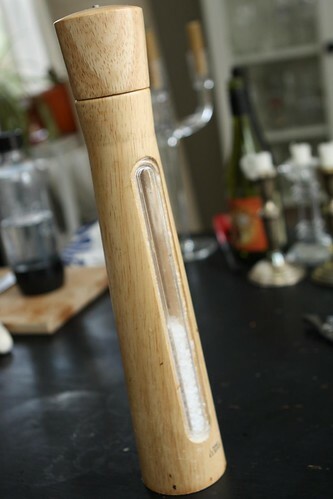 It was a sad day, however, in that our trusty salt mill (given to us by Jen's Mom) was broken. Actually it broke about a week ago. I ordered a replacement in and was excited to finally get back to grinding until I realized something depressing. The one I ordered was intended to run on batteries. Yes, that's right. Batteries! While pondering why anyone would want such a device I was further enraged by the fact that it took six -- six! 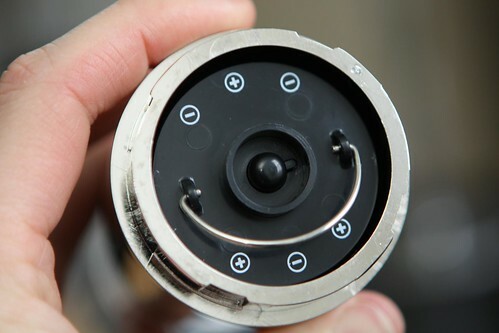 -- AA batteries to operate this salt grinder. I'm going through enough batteries in my battery-operated forks in knives. 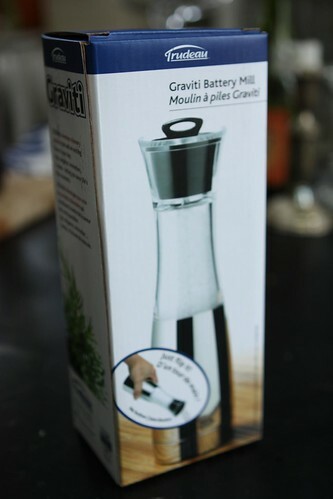 I don't need to add to that expense for a salt grinder. Now if they came up with a battery operated pillow then that would make sense. I'd definitely pay money for that. 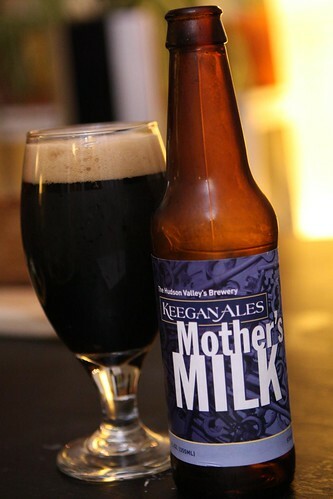 I figured, to keep with the baby theme for tonight's dinner, I'd go with a milk stout. I couldn't decide between these two milk-themed beers so I figured I'd just have both! 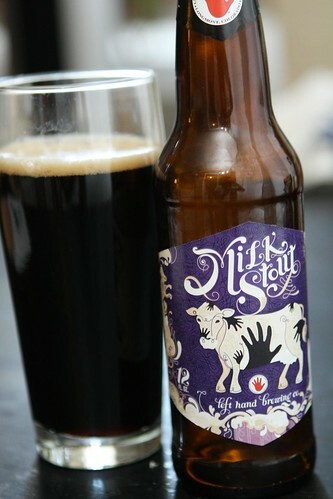 The first was the Milk Stout from Left Hand Brewing Co. in Longmont, Colorado. I was very happy with this stout. It was rich and creamy with a very faint liquorice flavor and a quality that I like to call "imaginary chewiness" which is one of my favorite characteristics in a beer. 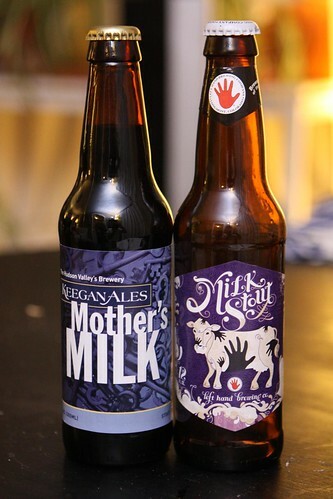 The second beer was this Mother's Milk, a slightly more local stout from Keegan Ales in Kingston, New York. I had this beer once before, on tap, on my birthday last year. This was extra fitting considering how my birthday just happened to fall on International Stout Day. This beer scored extra points for having the word "mother" in the name of the beer. 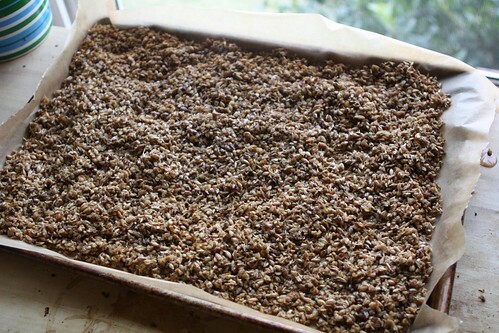 After brewing beer with all grains you have a tremendous amount of spent grains at the end. Even with these small one gallon batches I had all this grain. 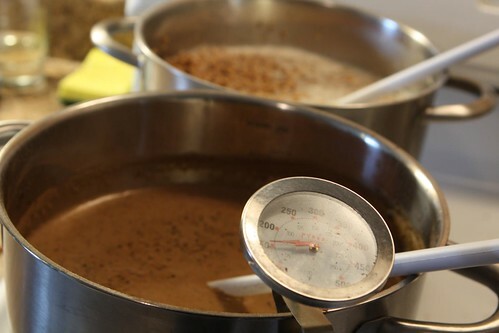 Luckily there were some really nice recipes on the Brooklyn Brew Shop website. After stumbling across a recipe for Barley & Chocolate Peanut Butter Bars it became clear that this was definitely what I was making. I made a crust out of the spent grains, some pretzels, a little granola, some brown sugar, and butter. After it was done I topped it with a mixture of peanut butter, powdered sugar, melted butter, and chocolate chips then topped it with melted chocolate and milk. 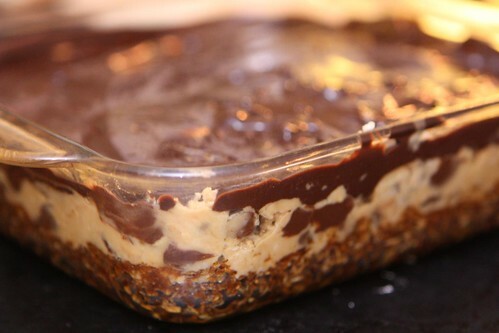 This recipe is actually remarkably similar to my peanut butter chocolate bars, the first recipe I ever wrote down from my Aunt Vivian as a teenager. The bars were predictably delicious. After drying out half the grains in the oven all night I put the second half in before bed in hopes that we would awake in the morning with all of the grains completely dried and ready to use for more recipes. My only hope was that we would not burn the building down in doing this. If we could overcome this fear all would be well. Now we only have to get over the fear that one day Oprah will eat our babies. I love your blog posts! They are always so entertaining! 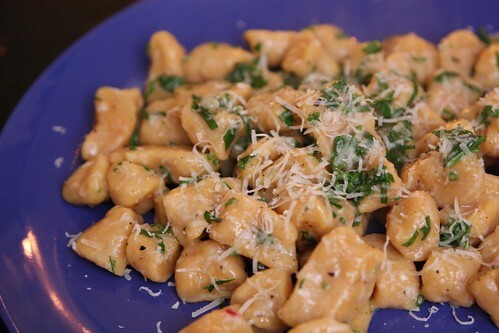 Also, sweet potato gnocchi is so delicious and yours looks great. P.S. 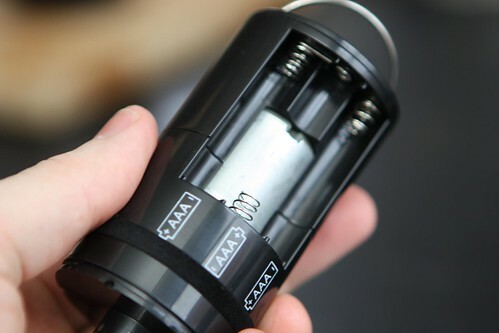 Did you end up using the battery operated salt grinder? Was it neat? Thanks so much! It seems like we're meeting twins everywhere now! I didn't use the battery operated grinder. It seemed far too unnecessary. Just ordered a new one that is hand operated. Thanks again for the compliments! I always look forward to your posts as well! Since you are our "other" son, can we be the "other" grandparents? Absolutely! Other Grandparents it is! Just want to say that is the cutest most beautiful pic of Jen ever! Love it! I just hope they like pureed risotto! Allagash Stew and Napoleans Too! Sweet Potato Chowder and World War, Too!